You can check the last entry here. The group has reached to Miyakojima, a Japanese island far away from the mainland; other members of PAB reached the place yesterday, since they wanted to dive and investigate about the Otori, especially because some places don´t allow it…Also some places don´t allow PAB members…Wonder why that is. The group goes diving and the juniors (sans Iori) and they can see some beautiful scenery, in some part even Chisa though about Iori and how the sight was similar to the one at the aquarium; but more beautiful… A sight that Iori won´t be able to see. That part has ended and it´s the moment for a lunch break! Aina is amazed for what she saw, and Kouhei too, although Iori wasn´t able to see any of that. Everyone can feel that Iori has been distant and very quiet. In any case, the moment for a new dive for the license users has come! Although Chisa has decided to stay by saying that he ear aches. While the other members of PAB went diving, Chisa decided to go and check up on Iori, she can feel his sadness and disappointment by not being able to go and hang out with everyone else, so she tries to cheer him up by saying that while it is a pity, that he wasn´t able to go, it doesn´t mean the next time he won´t do it! Also she has some tickets for the aquarium, so if he wants they can go and see everything again! Iori turns back and reveals that what he has is some serious sea sick! Chisa, somewhat disappointed gives Iori some beverage to help him. Our hero then gives thanks to Chisa for trying to cheer him up, she truly is a good woman; also Iori tells her that while he is disappointed, he won´t hate diving because of this! Also yeah, there is a next time, and then both of them can go together since Chisa skiped the last part. Chisa agrees; but it will be on Iori´s money! After that long and fun day everyone goes back to land… Now it´s time for the Otori! Sadly it seems the place they were going won´t open, so… They (for Iori and Kouhei´s dismay) will do their own Otori version! Everyone start putting their favorite alcohol (spirytus) while saying some words to their comrades; after failing to lower the alcohol count with water, Iori and Kouhei decides to put some weaker alcohol (weaker than spirytus that is) and ended up messing up with each other in a very funny fashion! In any case the party has begun and everyone is enjoying their time together! Until they got out of booze so Aina and Iori decides to go together and buy some more. She had a total change, she started acting somewhat cute and looked like she was about to confess to Iori, even Kouhei wondered if a “true end” sequence was coming for them! All that fluffy stuff erased when Aina decided to strip both Iori and Kouhei, so both of them started running for their lives and virginity! Soon both of them are resting looking at the sea and the big moon; Kouhei tells Iori that it´s his fault that he is on this club to begin with! Still Iori tells him that this is what Kouhei wanted, he wanted a club that would open the doors to a dreamy and fun life… And yes, he obtained that. Both looks at the ocean glad of the things they have experience, while a beast called Aina was hiding in the shadows ready to attack! 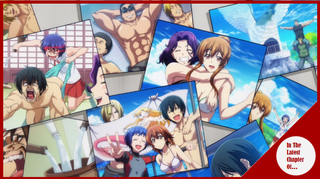 The next morning, everyone is going back home, while Chisa, Nanaka and Azusa looks at the photos in the plane, Chisa´s face tell us everything we need to know, she truly likes the people and life she has now… Even if it means being surrounded by a bunch of guys who likes to be naked for some reason. An acceptable finale for a very good comedy series; the ending was extremely open ended with a lot of things going, and plot points not resolved (Iori´s license), but that´s to be expected since for the most part the anime is very based on the manga. All in all this was a very good series that lacked a lot on the budget; but for me, it accomplished in most part of the series run by having some exaggerated voice and the facial expressions; still I think it lacked for when the story wanted to make you feel other feeling that is not wanting to burst out laughing, making that the dramatic character development of the characters be very watered down. Still, as I said it was still a very good first season and with just some tweaks and more money in a second season it can become amazing! On this last chapter it was very funny in how they followed the actions of the story, although is somewhat sad that it didn´t had what it could be a solid ending, I mean not an anime only; but something that make a good stopping point for the anime viewer while at the same time invites them to keep reading the manga, since it was a very loyal adaptation in that regard! Still, all in all it has been some amazing 3 months and be ready because this fall season I will be covering a new anime, which it has been already decided! So please look forward to it!